Rain, rain, go away, you make me have a bad hair day... Alright, we know that April showerss bring May flowers, etc., but all this rainfall can really put a damper on our high flying lifestyle. From the wet hair and clothes to the soaked feet, rain is not always our friend. But! If you have your trusty umbrella with you, you (and your hair) are safe from the fearsome weather. These bubble umbrellas are our favorite thing in the world. They have a wonderfully round shape, which helps protect you from stray rainfall, but you can see through them, so you don't create a traffic hazard! Also, they're pretty stylish, as far as rain gear goes. 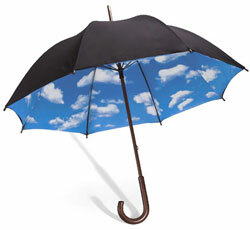 Carry a little bit of sunshine with you this April with this beautiful blue sky umbrella from the MoMA. It's like a little piece of heaven floating over you all day, but is sturdy and functional as well! Your umbrella can be educational as well. 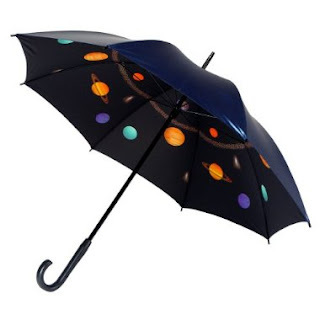 For instance, if you've always been interested in the solar system, but never had time to memorize the planets (MVEMJSUNP) then this solar system umbrella is just the thing for you. Just don't get too hooked on Pluto, last we heard it was demoted. Sad face. 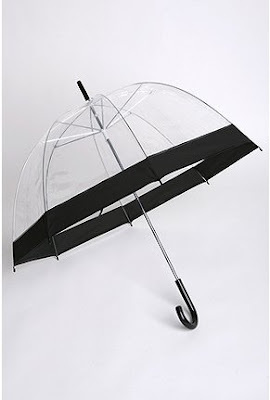 Look simply charming in the midst of a thunder storm with this umbrella from one of our favorite designers, Kimichi Blue. 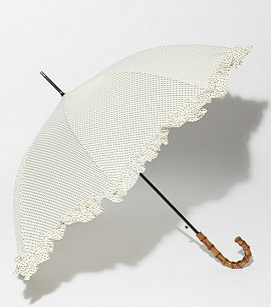 With delicate polka dots, sweet ruffles, and a faux bamboo handle, this cute umbrella looks delicate but is certainly sturdy enough to keep you dry. The worst thing in the world is getting stuck in the city in the rain, especially if you don't know where you're going. With the official MTA umbrella, you'll always find your way home. While we don't quite get how you can read the map and stay dry at the same time, we'll leave the details to you. Dreary weather got you down? 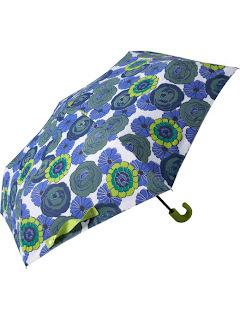 Cheer up with this colorful umbrella from Old Navy. We love the whimsical print and color combo here, with shades of cool blues and bright green. Stormy weather and gray skies can leave you in a sleepy kind of haze. Be bright eyed and bushy tailed with this energizing umbrella from Target. 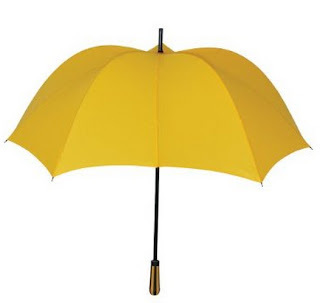 It's cute pumpkin shape is certainly unique and the bright yellow is sure to stand out in a sea of gray and black, making it easy for those Ted Mosby like characters to spot you. Now, bring on the rainbows!